A young lobsterman places lobsters into a crate aboard a lobsterboat tied alongside the Stonington Fish Pier on August 4, 2012. A growing group of Maine lobstermen are looking to unionize in order to gain a voice in state legislation and get better access to other benefits such as health insurance. It’s a slogan that has yet to, well, catch on — but if a growing group of lobstermen have their way, some of the state’s fishermen will join an international labor organization in a bid to have more clout in their industry. 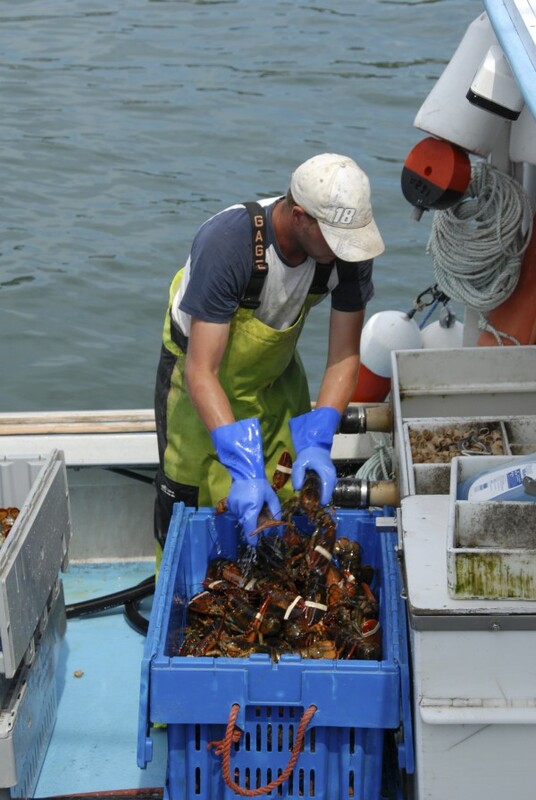 Justin Dyer of Vinalhaven, whose family has caught lobsters for generations, said this week that his motivation to pursue unionizing really began last summer when a glut of the crustaceans drove down prices. That sparked a blockade of Maine lobster by Canadian fishermen and a massive boat tie-up by Maine fishermen. If the lobstermen unionized, they reasoned, they could be part of the conversation in Augusta about new regulations and other ideas that might affect their livelihoods. He gave as an example a proposed law, LD 486, which aims to reorganize the state’s Maine Lobster Promotion Council and increase the annual marketing budget to $3 million. It might sound good, Dyer said, but the problem for lobstermen like him is that they would pay for 75 percent of the increase through surcharges tacked on to their licences. In addition to the hope of having a bigger say in Augusta, some lobstermen are looking forward to being eligible for health insurance through the union. “That’s a major part,” Dyer said. He acknowledged that the Maine Lobstermen’s Association, an industry group his great-grandfather helped found in 1954 and which now has 1,200 members, does good work. A union would just be another, more visible tool, he said. And the state’s lobster cooperatives are businesses run by the fishermen for the fishermen — which is a great thing, Dyer said, but different from his ultimate goal of having lobstermen help to lead their own industry. “We’ve never been organized. We need to be proactive in our own industry, and we haven’t been,” he said. According to its website, the Maine Lobstermen’s Association works at the state, regional and federal levels to sustain both the lobster industry and the resource. Patrice McCarron, executive director of the MLA, said Friday that her organization is not involved in the union effort. “We have been working to improve the lives of Maine lobstermen for 59 years, and we continue to pursue our mission to advocate for responsible resource management and prosperity for Maine’s commercial lobstermen,” she said in an email. Dyer and eight other Vinalhaven lobstermen and women spent a week in February in Maryland meeting with organizers from the International Association of Machinists and Aerospace Workers. That union has about 400,000 members internationally and between 7,000 and 9,000 in Maine, according to organizer Joel Pitcher. The Maine members include shipbuilders at Bath Iron Works, papermill workers, school district employees and others, he said. Maine lobstermen — there are about 5,000 in the state — tend to be small business people who own their own boats and have a reputation for independence. Nonetheless, they would fit right into the union, Pitcher said. Lobstermen might not seem like typical union members in another way, either — they won’t be squaring off across a table from an employer to bargain over wages and benefits, Pitcher said. If they do form the union, the fishermen won’t be able to meet together to fix prices, which is illegal under antitrust legislation. They also won’t just start striking in order to raise lobster prices, he said. Instead, unionized lobstermen would collectively go to the Legislature to share their concerns. The Vinalhaven lobstermen talked about their experiences with the union organizers in Maryland at the recent Maine Fishermen’s Forum in Rockport and generated interest among their fellow fishermen. Since then, Dyer, Pitcher and others have been traveling up and down the coast, talking to both small and large groups of lobstermen about the benefits of joining the union. Earlier this week, 160 people had signed a card saying they wanted to join up. Pitcher said the group was shooting for 200 signatures. “After that, we’ll write the charter, form a local — we’ll be off and running,” he said. Organizers recently met with nearly 40 fishermen in Jonesport and about 15 in Cutler.